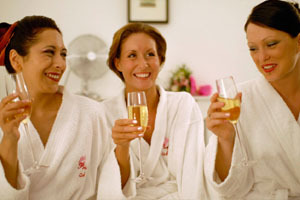 Pampering parties are not just for kids and teens – we also offer adult parties through our Pamper Me UK business. One of the most popular parties is the Girls Night In – a great way to relax and laugh with friends. Sometimes we forget about old friends with other commitments such as work and relationships. Don’t forget that your girlfriends are just as important to you as other relationships; so why not get all the girls together and have a girls’ night in? Pamper your girls with a girls night in; whether you are getting ready for hen parties, baby showers, birthdays or just a good old gossip with the girls! Some popular pampering options range from back, neck and scalp massages to eyebrow shaping or manicures and pedicures. Treat you and your girls to some pampering sessions that you truly deserve! Lacking ideas on what to do for a girls night in? You could unwind in a professional spa if you have the money, but there are alternatives for those on a budget. You could save some time and money by opting for a home pampering session with your closest friends. Booking a pampering session is probably much simpler than you think, just call Pamper Me UK on 0113 264 0167 or email us at info@pampermeuk.com. You can catch up with your loved ones for a relaxing and unwinding pampering session, all in the comfort of your own home. You should allow around 3 hours of time for a good pampering session with the girls, however different treatments and companies have different length treatments. See our website for more details of each pamper package. You don’t even need to leave the house to get a luxury and indulging pampering session, this can all be done in your own home, with your friends. Have fun!